My ongoing search to build a handmade wardrobe that I will wear regularly (not just quarterly when I break out the iron to press my cotton dresses) led me to Butterick 6101, a Katherine Tilton pattern. I liked that it could be done in knit or in woven, and had multiple sleeve options. Plus, it has a bit of lagenlook, which is something I love in moderation. What follows is a story of infatuation, then doubt, then reconciliation, then enduring love. 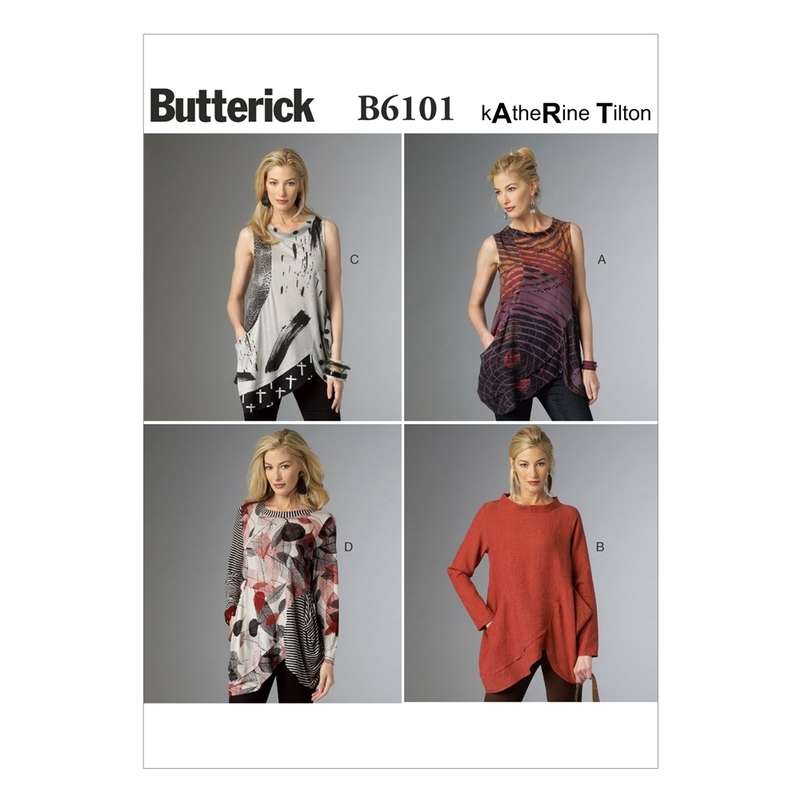 If there was a Lifetime channel for sewists, Butterick 6101 would be the Friday night made-for-TV movie. 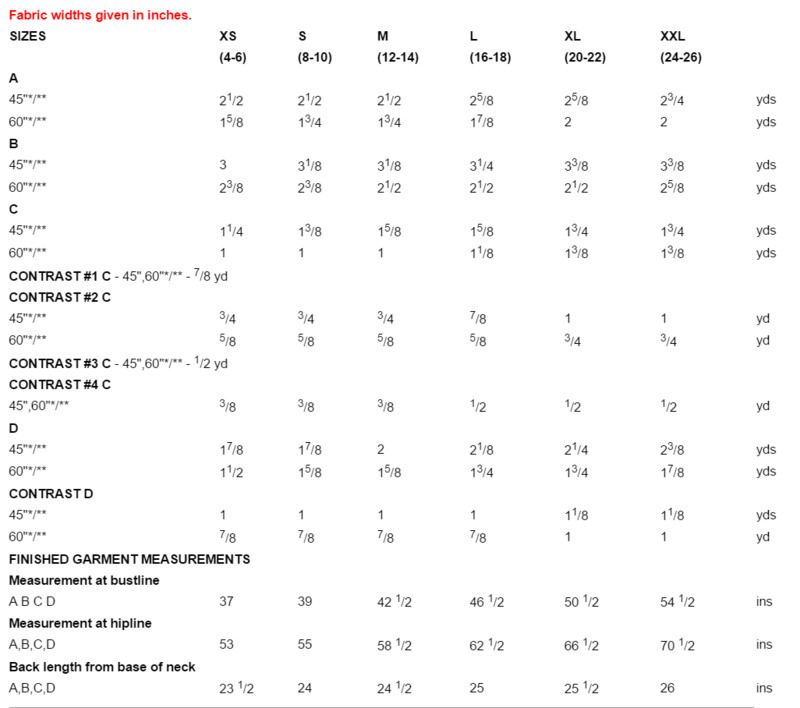 While my measurements would put me at a size XXL, I sized down for two reasons. First, I can almost always go down one size in Big 4 patterns. Plus, because I was sewing a knit, I knew I wanted a tiny bit of negative ease through the bust for nicer shaping. After looking at the finished bust measurements, I cut an L at the shoulders and bust, grading out to an XL in the waist and hips. Aside from grading the pattern between a Large and XL, I cut and sewed this pattern exactly as directed. If I had sewn this pattern with a woven fabric, I would have done a quick muslin to determine if I needed an FBA. I really liked the original fit of the finished top – it was relaxed, had interesting detail, and pockets. I LOVE THE POCKETS. The gray jersey had a touch of spandex, which gives it nice recovery. It was so cozy and comfortable – basically yoga pants for my upper half. Did I immediately take a nap in this top? Yes. Yes, I did. Overall, construction was quick and straightforward. I used my serger for everything except for hemming the sleeves and a bit of topstitching. The only tricky part of construction was the bottom hems/facing – I don’t know what happened, but things did not line up and I ended up having to kind of mash the edges together, sew them together, and hope for the best. It’s barely noticeable (especially because the knit is forgiving) but I will rethink the construction of the hems the next time around. This is an issue that other people have noted online, and there doesn’t seem to be a clear solution, so proceed carefully on that part of the process. After wearing the top around the house for a couple hours, I realized that it was TOO comfy. A closer inspection in the mirror, along with a very technical “grab handfuls of fabric on each side of your body” technique, I realized that I needed to slim down the silhouette. A lot. It took me a couple of runs down the sleeve and side seams, but I eventually took off EIGHT inches at the bust, tapering down to 2 inches at the biceps and hip. The final version is still just as comfy, but looks less bulky. I will definitely make this pattern in a woven – either a chambray or a voile. I think that both options could offer great warmer weather options, especially with the sleeveless option. I’m not sure if I’ll make another knit version – this pattern is pretty distinctive and I think one (however delightful) might be enough for now. Still snuggly. Less tent-like. And marvelous, marvelous pockets. One thing I do want to mention is that the neck band is a little weird in a knit fabric. In a woven, you would interface it for additional stability, but I didn’t do that in my version. As a result, it’s a little wobbly – not quite strong enough to stand up briskly on its own, just a little wavy. (I have a vague recollection that the instructions called for knit interfacing, but I didn’t have any on hand so I skipped it.) I find myself fiddling with the collar frequently, trying to get it properly situated. Next time around, I would either make the band taller (for a cowl look) or do a simple binding. Yes, I do mess with the collar every 10 minutes. 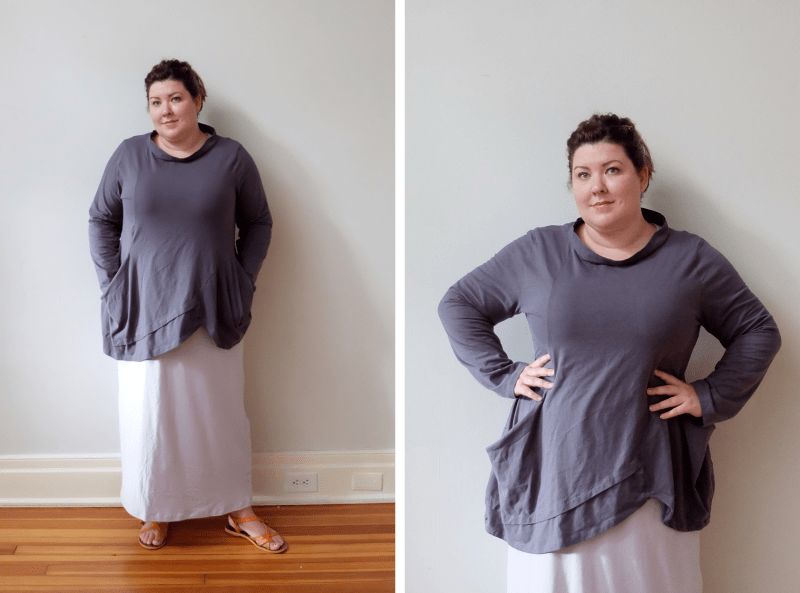 On the other hand, I have worn this top almost every day since I’ve made it – it’s so easy to toss on with yoga pants, over a maxi dress, or over my pajamas on a cold morning (or, you know, when I take an afternoon nap). I’ve even taken to wearing it on my afternoon round to the chicken coop – those voluminous pockets can easily accommodate a dozen eggs on the short walk back to my kitchen. At this rate, I’m going to wear holes in it by the spring, so perhaps I need to make a back-up now. 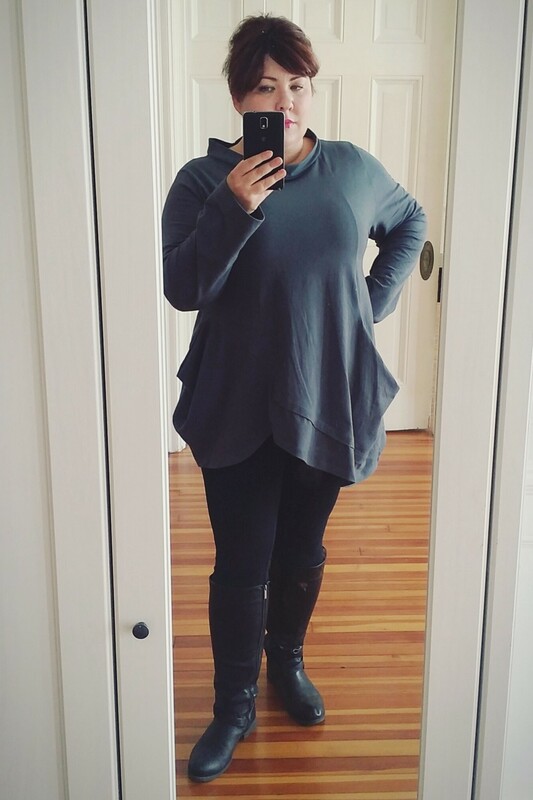 My preferred look is now to wear this top with leggings, but it works over a maxi dress too! There are no darts in this pattern, which make me nervous about sewing it in a woven. If you are a B/C cup, you can probably get away with the flowing shape. 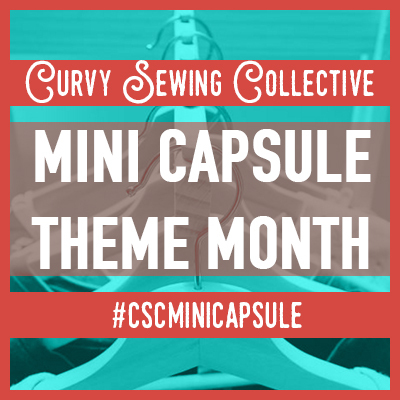 But if you are a D cup or bigger, you’re going to want to think seriously about whether inserting some darts (along with an FBA) are necessary to give you flattering shaping. Very flattering once you altered it. Highlites your pretty face and curvy shape. Great for us Apple-shaped gals. Much better once you altered it, you look like you’re having so much fun wearing it. I just got chickens, about to start laying soon. I am thrilled that I need a new top to go with my chickens! The perfect review, full of important information and lovely insight into your personality. Probably beyond my current skill level, but what the heck, I am so temped to try it. Do it! Honestly, except for the hem facings (which probably just need more patience in reading the directions than I can be bothered with) it sews up so fast and easy! This is so cute! I am always drawn to the tilton pattern but don’t always make them up because I don’t know how to style them! I like the leggings and the maxi skirt you’ve chosen. I’m getting some ideas! Thanks for the review on this, I REALLY like it. Like a sweatshirt but fancier! Thanks Megan — I really like it too! I feel like it’s a fancier version of a sweatshirt that looks put together enough for errands (and lots and lots of naps — never forget the naps). This top looks fabulous on you! I think the collar is a distinctive feature, and losing it might frame your face far less effectively. A self-facing made from the same fashion fabric might do the trick for knit versions. I went back and looked at the photos. Totally agree — there is a very nice “face framing effect” with the collar. I will definitely interface the next version. Body type- Awesome. Best answer ever. 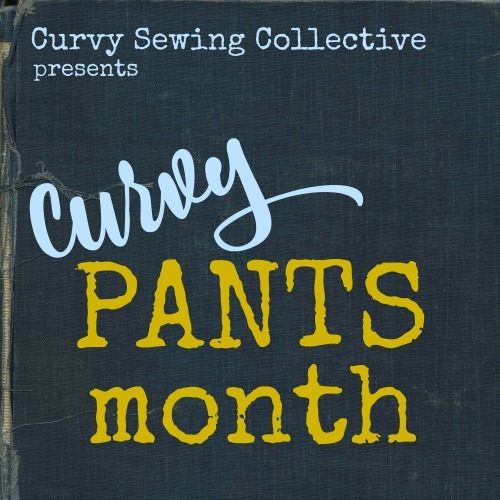 Ha ha – a Lifetime channel for sewists, love it! Great review- this is a fun pattern! You know what? I love the neckline! It looks like a chiaroscuro band, it’s the perfect frame for your face! Great review, wonderful garment! 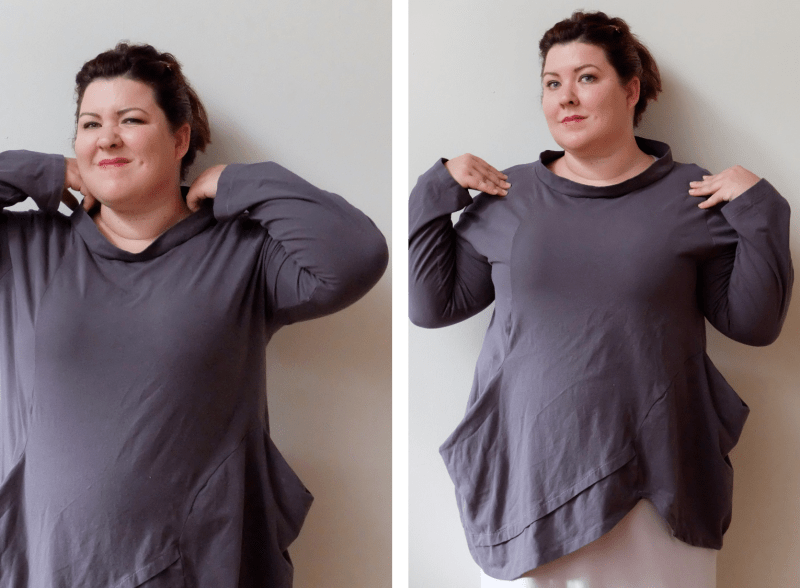 Knit interfacing is amazing wonderful stuff – get some immediately! I use it all the time, keeping it on hand in white and black. I love this review! Thank you. I usually make clothes too big. So I love the before and after pic. You can see that in some of the early photos I am wearing leggings — and it’s definitely the “best” look in my opinion. The top is long enough to comfortably cover my bottom, hitting at low hip. Thanks for that review. 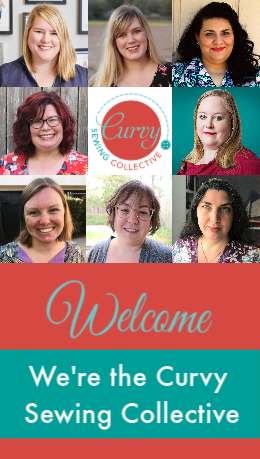 I’m really enjoying the blog and look forward to seeing the adjustments you all make to patterns. This is one that I have, but I’ve not made it yet. I use a Size 14 pattern and then do an FBA on everything because of my 38 DDD bust. This is another one of those patterns that doesn’t have the obvious places to do the FBA. Wish I could find a tutorial on sizing the shoulders down instead of sizing the bust up when the top has no darts. I’m definitely going to give this one a try soon after seeing yours. Thanks so much for sharing your experience. Yet another awesome review! I love your body type description!! I am going to borrow that! This pattern is not for me. Too much going on. I still love funky! So keep on sewing and keep on reviewing! It does have a lot going on, doesn’t it? I don’t mind, since 99% of my clothes are “plain jane” in terms of embellishments, ruffles, pintucks, etc. I decided I needed at least one comfy item with a bit of pizzazz. 🙂 I get a ton of compliments on this top — people can’t believe that it’s handmade.